Not long after I complained bitterly about not being able to see some of the world’s best chefs lecture at Harvard, I learned that I had been mislead about the “general lectures.” They were indeed lectures by the same chefs that would present to the students, each preceded by a ten-minute summary of the science that was taught that week. Although I had already missed the Ferran Adriá/José Andrés/Harold McGee lecture, I would be able to attend others if I was willing to show up early and deal with a long queue of the curious. The slide that followed provided a “map” of the plate, with the explanation that every spoonful should include the three center components (bean purée, pancetta chip, Guinness foam) and one of the components around the rim. Most of the lectures have an audience participation component, and this one was no exception. We were each given a small takeout bucket that held a plastic bag with a thin filmy liquid in it, and a container of powdery brown stuff about which I had some suspicions. The bag was a sample of distilled essence of freshly cut grass, which is used in the restaurant as part of the service for a summer tomato dish. The smell evokes an entire series of sense memories associated with eating tomatoes at the peak of their season, which Achatz argues would make a crummy winter supermarket tomato taste better. The other container, as I suspected, contained the dry caramel component of the “Dry Caramel, Salt” dessert that I had made for She Who Must Be Obeyed’s birthday dinner. 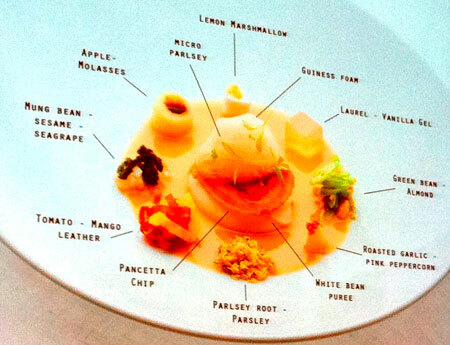 One of Achatz’s chefs demonstrated the preparation of the dish, which deviated significantly from the cookbook method I had used. Instead of combining cooled solid caramel with maltodextrin, the chef simply piped still-warm caramel out of a pastry bag into a food processor, added the maltodextrin, and gave the ingredients a spin. The result was what we all had in our containers, which was much more homogeneous than what I had been able to prepare. “Did you use a calibrated thermometer?” he asked. “Yes, you can. You’re welcome” he laughed. The full lecture is now available on Harvard’s YouTube page, or you can watch it here.